Golden Baba, 58, arrived in Ghaziabad in a cavalcade of 21 luxury cars for the final stretch of the 200-km-long Kānwar Yātrā. 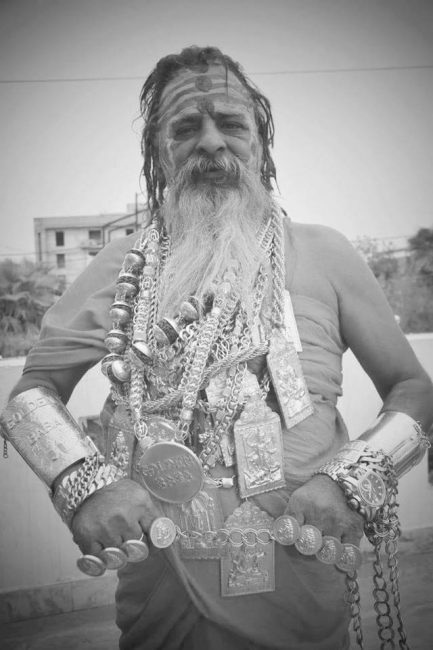 Unlike #Shiva – or #BhōlēBābā (Simple Saint) – in whose name the #Kānwariās undertake the 200-km Haridwar-Delhi walkabout pilgrimage, Golden Baba is laden with 20-kg of gold ornaments (including 25 chains, each weighing about 500gm) worth 6-crore in the open market. #ShriMahantJiGoldenPuriBabaji aka #BittuBhagat (he once manufactured and sold jeans branded ‘Bittu’) dangles a 27-lakh gold Rolex from his wrist. His entourage – which includes 18 bouncers and eight security officers – runs a BMW, three Fortuners, two Audis, two Innovas, a Hummer, a Jaguar and a Land Rover. #HisYellowness owns a flash apartment in Indirapuram in Ghaziabad. He is conservatively worth 150-crore. He doesn’t pay a single pæsā in taxes. Since he is temptation incarnate on legs – and wheels – his newly-appointed driver robbed him of 2-lakh cash and 5-lakh worth of jewellery in April 2018. The desire to relieve him of his beringed limbs must have been immense.